The National Cancer Registry has released new cancer incidence maps. The new cancer incidence maps can be found on the 'Incidence rates mapped' page. Maps are provided for all of the major cancers. This year, four new cancer have been added - liver, larynx, thyroid and testis. You can search by cancer, and download all maps on the incidence rates mapped page. 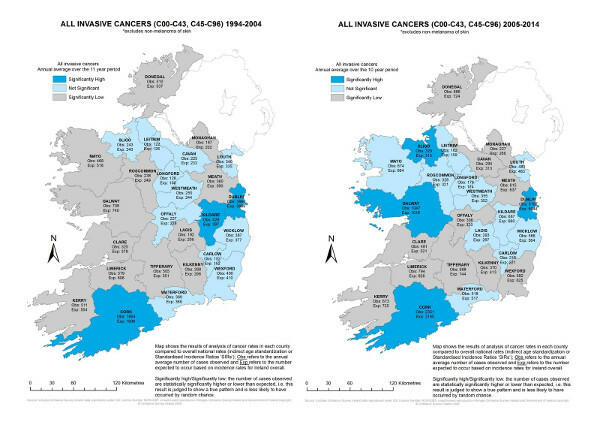 The maps show the results of analysis of cancer rates in each county compared to overall national rates. They are provided as a single map with years from 1994 to 2014, or a dual map with years from 1994 to 2004 and 2005 to 2014.